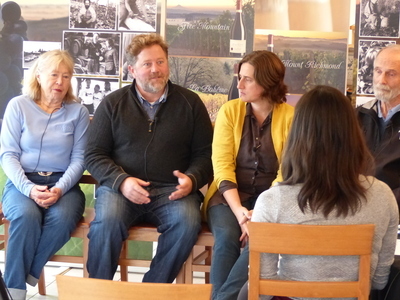 The Campbell family is photographed during an oral history interview at Elk Cove Vineyards in Gaston, Oregon. The Campbells were interviewed by Linfield College archivist Rachael Cristine Woody and student archives assistant Camille Weber. The Campbell family is one of Oregon's earliest winemaking families. In 1973, Pat and Joe Campbell moved their young family from Parkdale, Oregon to Gaston, Oregon to establish Elk Cove Vineyards. Their children Adam and Anna are now involved in the winemaking and marketing aspects of Elk Cove. Linfield College Archives, "The Campbell Family Interview 12" (2015). Browse All Willamette Valley Oral History Interview Photos. Image. Submission 11.